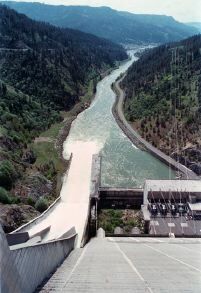 OROFINO, Idaho - U.S. Army Corps of Engineers officials say residents below Dworshak Dam on northcentral Idaho's Clearwater River have little to fear, despite the 36-year-old structure's recent rating as "unsafe or potentially unsafe." Water is squeezing through flex joints, known as water stops, on the front of the dam. In addition, many of the drains used to monitor water slipping beneath the foot of the dam are clogged and need to be cleaned so potentially dangerous uplift pressures can be checked. Still, Dworshak operations manager Greg Parker says the dam's 51 concrete monoliths remain robust and pose no danger of catastrophic failure, an event that would have dire consequences for residents living downstream in communities including Spalding, Lapwai and Lewiston. Parker says of the 400 megawatt dam, "It's as safe now as when it was built."